Posted on Thursday, May 13th, 2010 at 9:31 am. Like most other Taiwanese Americans, I love food. But I hate fusion cuisine. The term implies something equally Asian and Western, but have you ever been to a Wolfgang Puck’s, perhaps at an airport? Beyond the superficial addition of some exotic ingredient to some random dish we could find at Applebee’s, there’s nothing Asian about it. Tuna with Miso Sauce? Meh. Wasabi Mashed Potatoes? No thanks. Taste aside, these dishes represent another Western appropriation of Asian culture…food created for non-Asians, by non-Asians. True fusion cuisine wouldn’t only be a culinary experience, but a cultural one as well. As a Taiwanese American, I’m used to tension between the culture of my ancestors and the culture of here and now. My eating habits are no different. I love my cheap immigrant-filled holes-in-the-wall, with names like Super Lucky Prosperity 88 Dumpling Fortune. Yet I also love New American food trends of free-range meats, local sourcing, and sustainability, typically served in cleaner, pricier restaurants you might bring a date to. Why can’t I have it both ways? Enter Eddie Huang, the twenty-eight year-old Taiwanese American entrepreneur behind BaoHaus, a new eatery bringing gua bao (pork buns) to the Lower East Side of New York City. On the morning TaiwaneseAmerican.org visited BaoHaus, Eddie was wearing a black graphic tee and a gold chain necklace with a jade piece attached at the end. This is a man who looks like he eats a lot, laughs a lot and probably swears a lot. Looks aren’t deceiving. This guy is real. Good stories always seem to come full circle. After going to college, working in journalism, finishing law school, quitting his job as an attorney and founding a graphic tee company, Eddie ended up opening a restaurant of his own. “Just doing what I want,” he says. What Eddie wants bears little resemblance to either Cattleman’s Steakhouse or a typical Chinatown joint; BaoHaus is a reflection of his life as a Taiwanese American, a place where he and his friends can eat and hang out. 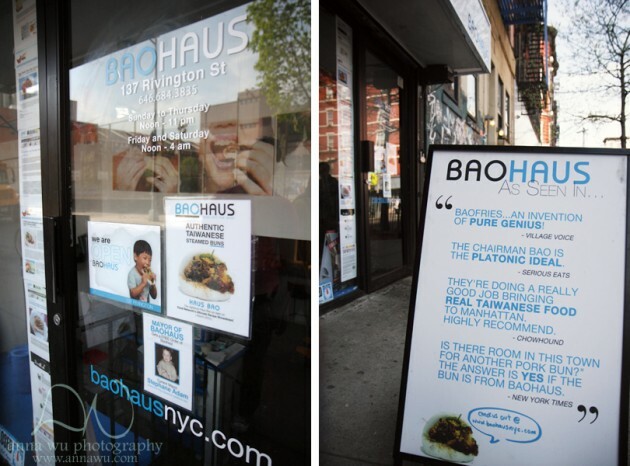 Located on one of the most hipster-filled blocks of Manhattan, BaoHaus is a clean, brightly-lit underground eatery (still a hole-in-the-wall) with large photographs of Taiwan adorning the walls. We can see our gua bao being freshly prepared in the kitchen by Eddie, his two brothers Evan and Emery, and a multi-ethnic staff. 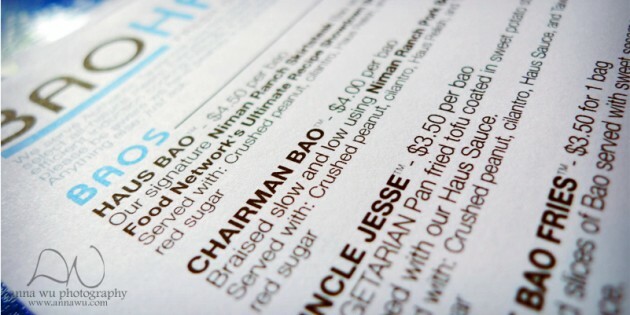 The menu, which changes constantly, is rife with comedic Asian American references such as the “Chairman Bao” or the combo platter known as the “Straight Frush,” misspelling intended. Calpico and Hey-Song Sarsaparilla are two of the “FOB Drinks” served. They’ve even made fried Twinkies. Eddie believes that in addition to media such as ABDC, one of the primary ways non-Asians experience our culture is through food, usually through takeout, a Chinatown restaurant or even Panda Express. 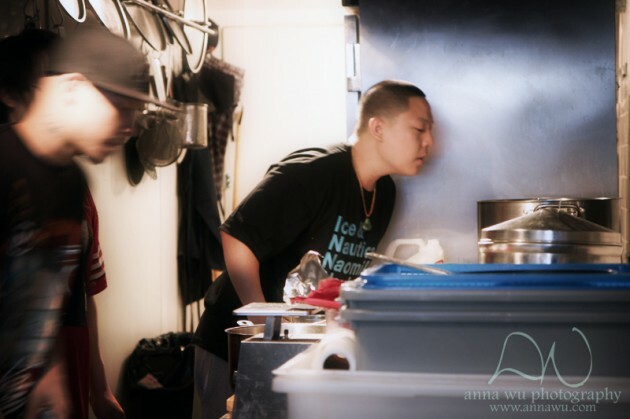 Therefore, confronting “the box” of stereotypes and perceptions non-Asians have of Asian Americans became one of Eddie’s motivating factors behind opening this restaurant. 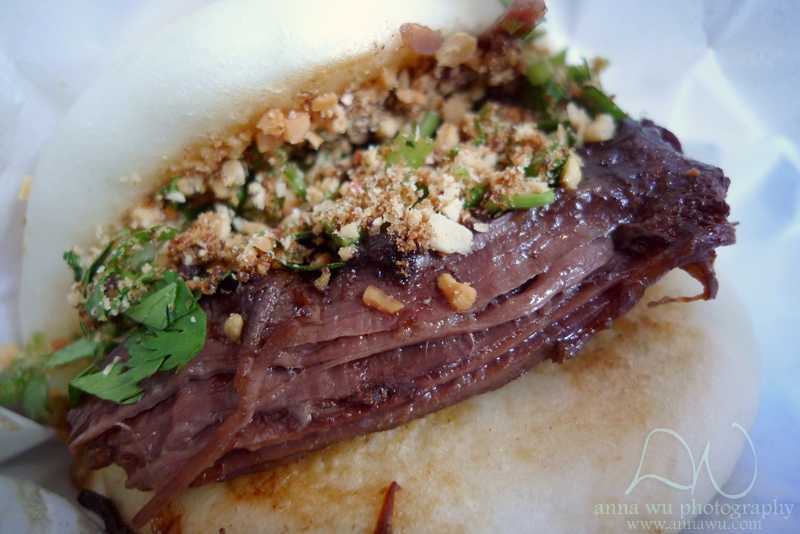 At BaoHaus, Asian American fusion goes beyond wall decorations and menu humor. No MSG. No color-treated meats. Many of the ingredients are traceable to their source (Niman Ranch, Creekstone Farms). There’s a focus on energy efficiency, friendly to both earth and operating costs. The recipes aren’t merely Asian-inspired; they ARE Asian, with the creative addition of ingredients such as Cherry Coke. Eat it, Wolfgang Puck! As am I. A Straight Frush comprising three gua bao stands steaming before me. The aromas of free-range pork belly, Angus skirt steak, and fried tofu mingle. My mouth waters, and I struggle to restrain myself from digging in before the food can be photographed. My first bite of the Chairman Bao is sublime. 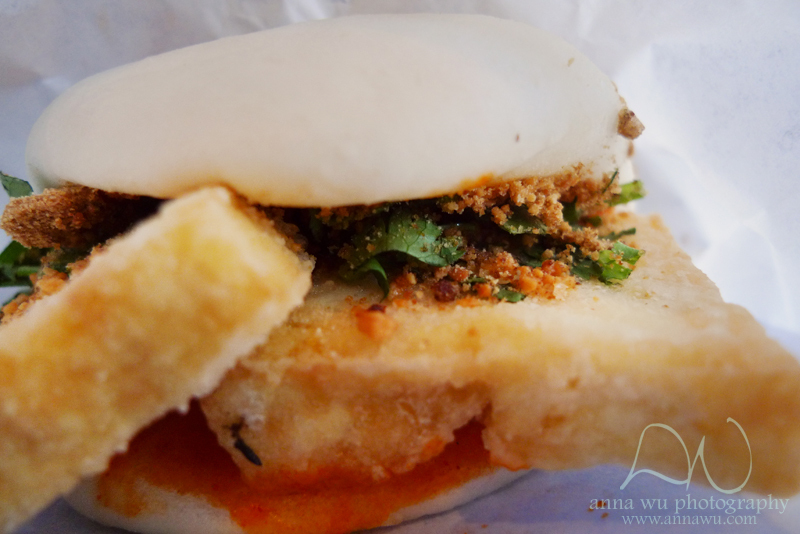 The white bao is warm and soft, just barely able to contain the juicy goodness within. The flavors of cilantro, crushed peanut, and pickled mustard greens ring sharply, a perfect foil to the richness of the pork belly as it melts in my mouth. 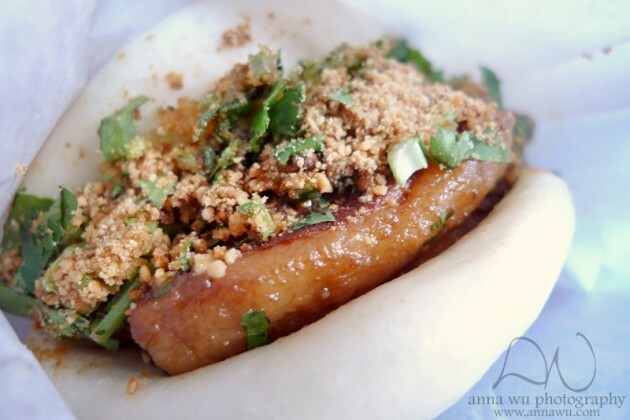 Onto the Haus Bao. Skirt steak, really? My brain thinks so, but my heart pleads otherwise. The tender, juicy meat is instantly reminiscent of the great Braised Pork Shoulder dishes served in Chinatown. Memories of hearty feasts surrounded by friends and family flood the senses. It doesn’t just taste good; it feels good. I could go on and on, so I will. The vegetarian Uncle Jesse is a delightful textural contrast between the sizzling-crisp tofu skin and the white softness underneath. The canned juices (I chose guava) are the perfect choice to wash down the taste of pork fat, if you’d wish such a heresy. 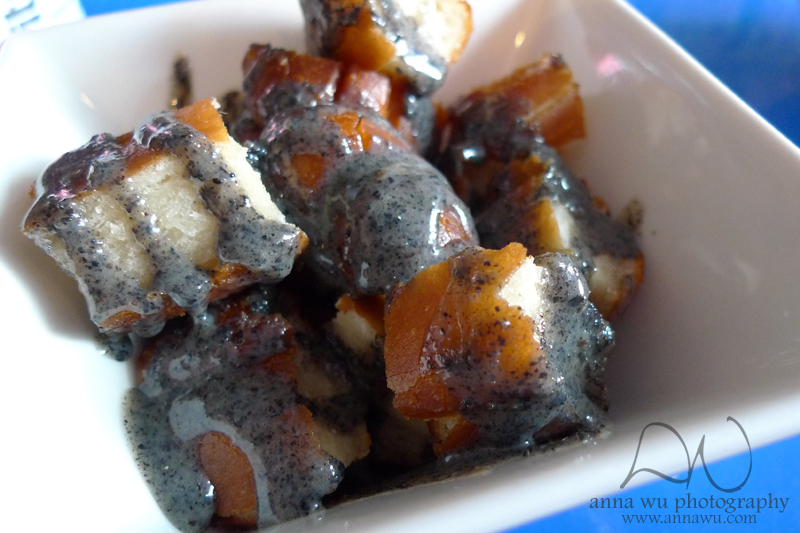 The sweet Bao Fries are culinary genius, made not with potatoes but with strips of Bao dough and served with a black sesame sauce. The smell of boiled peanuts reminds me of my ancestral home in Central Taiwan. Vince Huang is a man whose digestive organs have grown so powerfully large from intense operation that they have begun protruding outwards from his otherwise small frame. This phenomenon, also known as a gut or belly, is the most distinctive mark of his dedication to worldwide food exploration, most recently on his travels to South America. Vince graduated from Carleton College with a BA in Political Science and International Relations. During his time there, Vince was a Residential Adviser, edited the school newspaper, played intercollegiate Ultimate, and awkwardly entertained large crowds as a member of the Ebony dance organization. Vince served as a past Program Director of the Taiwanese American Foundation, worked at a law firm, and is now studying in a post-baccalaureate premedical program in New York City, where he continues to eat his guts out. inspiring! I share the same sentiments and intend to start my own restaurant over the next few years with the same goal of educating our society re: asian american culture. I’m sick of all of the stereotypes and it’s about time we have more representation!